In today’s article, we cover what you can expect from buying life insurance using Quotacy.com. Buying term life insurance online is more simple than ever before. Understanding the process from start to finish will help you buy your policy online with confidence today. Term life insurance quotes instantly. No contact info required. It all starts with getting your quote. 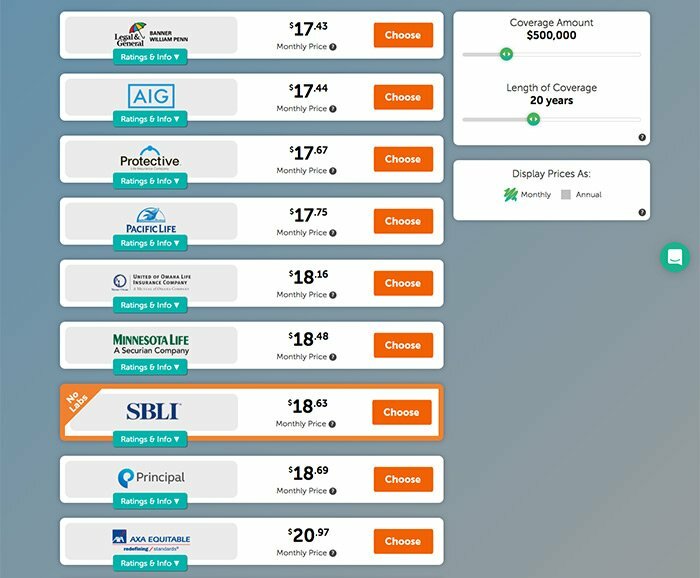 The benefit of using Quotacy.com to see your life insurance pricing is that you can do it all online without sharing any contact info. save time comparison shopping for your policy online. Some of our competitors promise instant online quotes, but require you to give up your phone number, email address, and other contact info to access it. This type of “lead generation” site gets you stuck in a cycle of unwanted phone calls from sales agents who will upsell you with more life insurance than you need. Quotacy doesn’t do business that way. Our founders built Quotacy to allow you to shop online for term life insurance anonymously until you’ve selected your policy and are ready to buy it by filling out your application. We do this because we know no one wants unnecessary hassle when shopping online for their life insurance. We do this because we know everyone wants transparent pricing right away. Answer 4 questions for instant online quotes. From the screenshot of our quoting tool, you can see that you just need to share your zip code, gender, birthdate, and whether you smoke or not. Then, click the orange “show my price” button…and we show you your price. Easy, right. We need your zip code because each of the 50 states in the USA regulates which life insurance products may be sold within their state. Your zip code tells us which state you live in. 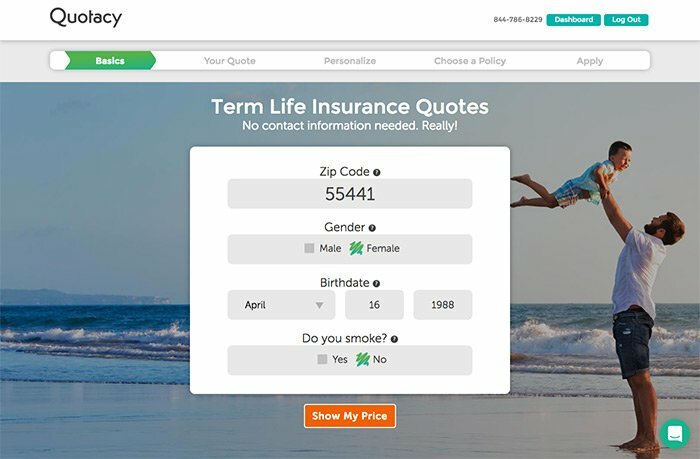 We only want to show you term life insurance policies that you could buy today, so knowing your zip code helps us filter out which products aren’t for sale in New York, for example. What a life insurance broker like Quotacy can do for you. The advantage to you of using a life insurance broker like Quotacy is that you’ll see your pricing for every policy option available to you in your state right away at one time when you run a quote. Having to go from website to website running life insurance quotes is tedious and time-consuming. Save time by seeing all of your policy options with one search at Quotacy.com. If you are curious about other coverage options after you get your initial quote, you can adjust the sliders back and forth to increase or decrease your coverage amount and length. Instead of a $500,000, 20-year term life insurance policy, maybe you want to see how much a $1,000,000, 35-year term life insurance policy would cost? Without switching screens, just move the sliders and our quoting tool automatically shows you different pricing. This can help you intuitively understand how life insurance pricing works. When you understand how life insurance pricing works, you can make better decisions. There is no reason for an agent to hide pricing from you until you call them on the phone because life insurance prices are legally regulated. So, don’t work with a life insurance agency that does that. It’s a waste of your time. There are no special deals to be found online. So, the quicker you can find out your pricing, the better it is for you. 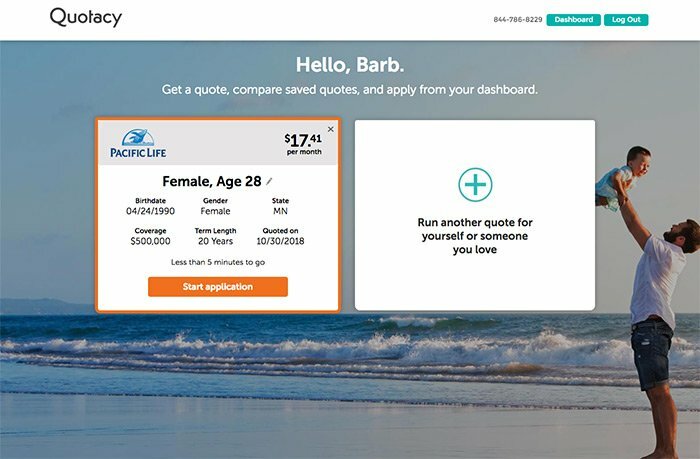 At Quotacy, we just show you your price right away online and let you customize it further as you wish by answering more questions about your health, your family medical history, and so forth. 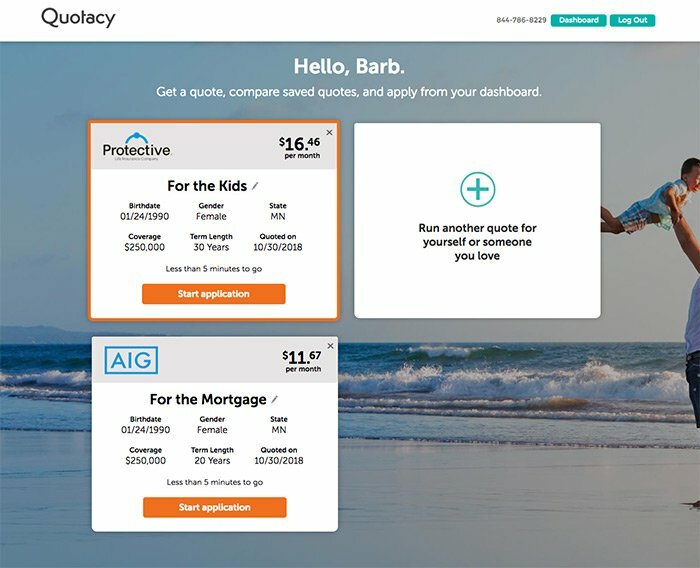 Showing upfront pricing is one way that Quotacy is helping to make the life insurance industry more transparent for online shoppers like you. Term life insurance is more affordable than most people think. 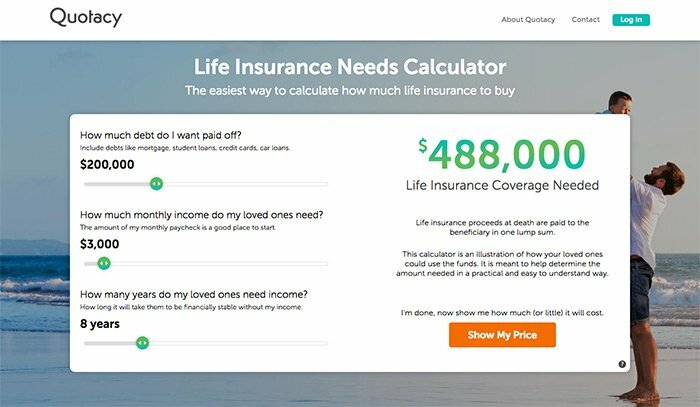 As you can see from the pricing shown above*, a $500,000 term life insurance policy that will last 20 years will cost less than $20 per month. *Pricing shown for a healthy, non-smoking female living in Minnesota born in 1988. 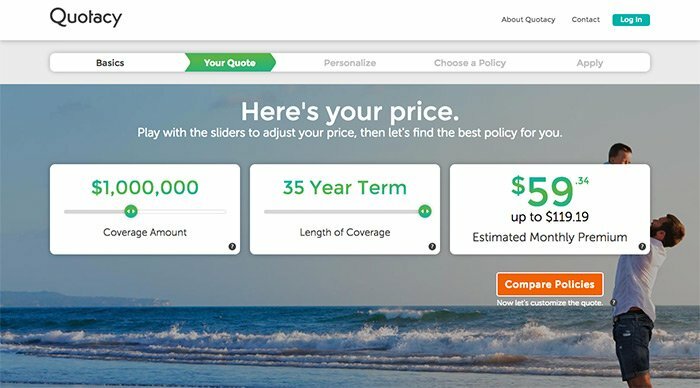 It’s easy to compare pricing for multiple term life insurance plans from trusted national brands with one search on Quotacy.com. Each life insurance company offered by Quotacy is best-in-class, financially-secure, and highly-rated by independent, consumer protection agencies. You can review their ratings here or trust that we only sell life insurance from reputable companies like ours. Get your quotes and apply online. 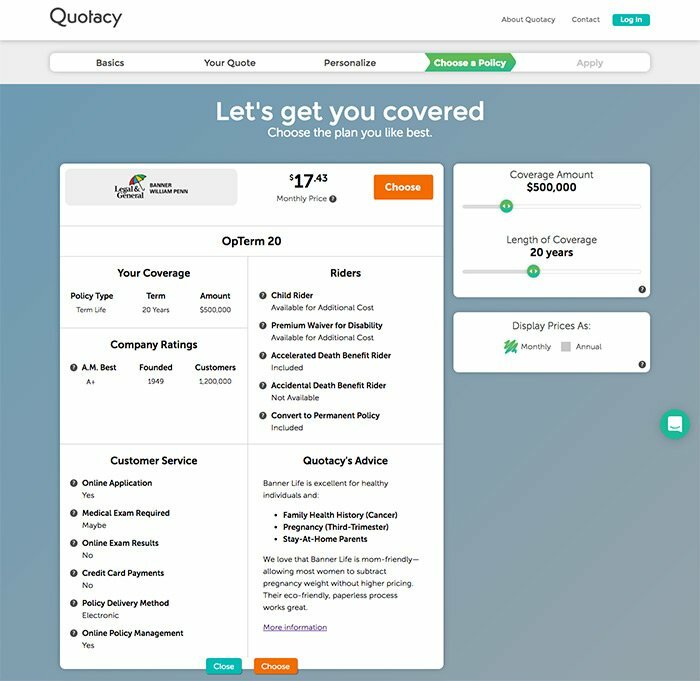 If you are the online shopper in your family or the person who manages your family budget (or both), Quotacy makes it easy to manage your household’s life insurance quotes and applications from one handy dashboard. If you run a quote for yourself, you can save it to your dashboard. If you run a quote for another person in your household (your spouse or domestic partner), you can save it to your dashboard. We know that you might be running quotes at a time when your spouse is at work and not available to discuss buying term life insurance. By pulling up your dashboard, you can go over the quotes later at a time that works for both of you. Buying term life insurance is a great investment in the financial security of your family. Knowing how that process works online at Quotacy.com from start to finish is what you’ll get from today’s article. You might be wondering which policy you should ultimately choose to buy and apply for from our list of options. You can just choose the lowest price, if you wish. There is nothing wrong with this strategy for buying life insurance, especially if you are young (under age 50), healthy, and don’t smoke. But, if you know, for example, that a close family member (your mom, dad, sister, or brother) died from cancer at a young age, then take a few moments to scan our Quotacy’s Advice tab for each carrier. For example, in the screenshot above under Quotacy’s Advice, you can see that Legal & General (Banner Life and William Penn) is one of the companies that we suggest for applicants with this type of family medical history. Quotacy matches you with the best life insurance company for your lifestyle. Some life insurance companies like John Hancock or Prudential are excellent in serving many types of clients, so you may not see all of their stand-out areas mentioned in our advice section Why? Because the list would take up too much space on your mobile, for example. Know we evaluate your online application after you submit it. Our in-house team of underwriters looks it over and if we think you would get a better price with another carrier, we will move your application to that life insurance company after asking your permission to do so. We work with a large range of excellent companies as a life insurance broker. A captive agent, working at State Farm, for example, is not able to shop your application on the insurance marketplace like Quotacy is able to do. That is why so many consumers are turning to brokers to help them buy everything from their home mortgage to life insurance online. Every day customers get quotes and then apply online in minutes at Quotacy. Our process is so simple that anyone can do it easily themselves just by following the steps in our quoting tool. Just coast right through from quote to covered anywhere, anytime. But, if you need more guidance, don’t worry. If you don’t know how much life insurance you need to buy, we can help you online as well. The easiest way to figure out how much life insurance you need is to use our calculator. Our needs analysis tool is free and you can calculate your family’s life insurance needs without having to share any of your contact info. If you just want a quick way to figure out your needs, multiply your salary by ten. 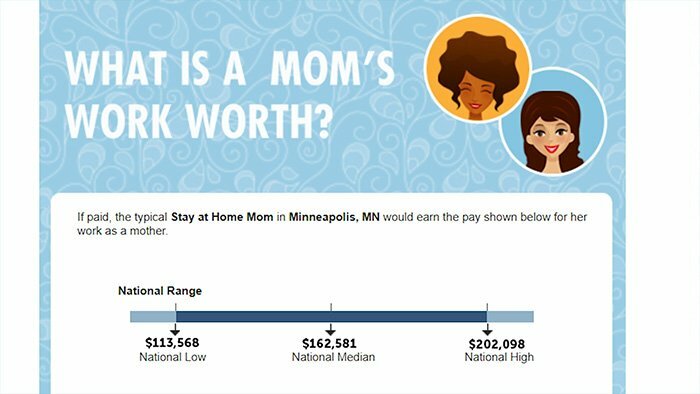 Let’s say you’re a stay-at-home mom, your caregiving (“salary”) is worth at least $100,000 a year depending on where you live. Multiplying $100,000 x 10, you would buy a term life insurance policy with a coverage amount of $1,000,000. If your youngest child is 10-years-old, you could buy a 10-year term life insurance policy that would take care of his or her needs up to age 20. A 10-year term life insurance policy is very affordable for most parents. So, even if you can’t afford a policy that lasts 30 years, it’s good to get a policy in place for your child’s most vulnerable first 10 years of life. Sometimes the best life insurance policy is actually two policies. After you calculate you life insurance needs, you may realize that it’s more cost efficient to buy two life insurance polices rather than just one. This is called laddering multiple life insurance policies with different coverage amounts and lengths. This is easy to do at Quotacy because you can save your quotes on your dashboard. From Barb’s dashboard screenshot shown above, you can see that she is planning on buying one term life policy to take care of her kids and another to cover her home mortgage until it has been paid off. 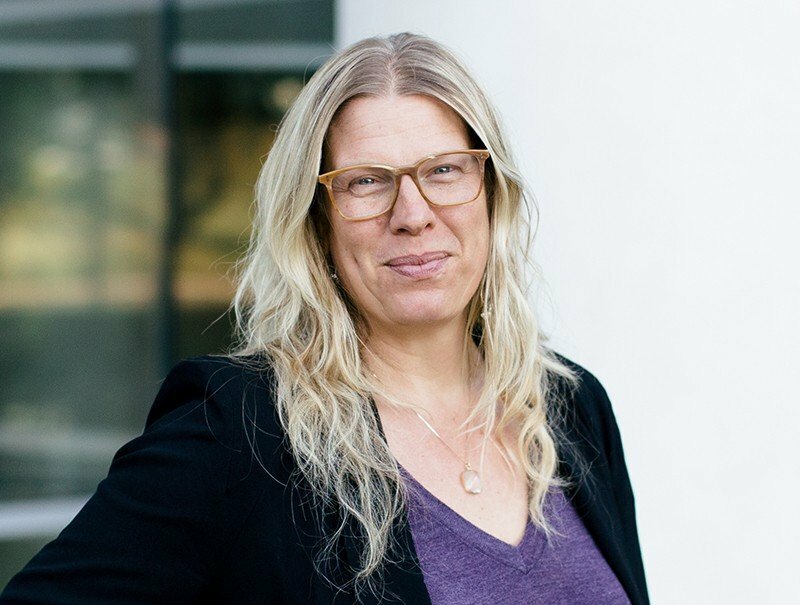 Overall, Barb is going to save money on her life insurance (over the course of 30 years) by purchasing two policies that cover her needs perfectly for only the time that she needs the coverage. Why buy term life insurance online? To protect the ones you love. We make it easy to insure your family today. We’re committed to helping one million families protect their loved ones with the gift of affordable life insurance. We’d be honored to help you protect your family. Get started by running a free quote today to see how affordable a term life insurance policy might be at Quotacy.com. If you wish to review all of the steps from getting your quote to having your application for life insurance approved, we’ve laid out the details here in our life insurance buyer’s guide.